Given the way that the Wall Street Journal and its biggest client, the National Association of Realtors keep you in the dark and feed you manure, they must think you are a mushroom. They did it last week with the “existing home sales” and have done it again this week with the “pending home sales” release. Pending home sales were down, not up, in May, as the report said. Here’s why the WSJ may not be interested in allowing you to see the light of day. Rupert Murdoch’s Wall Street Journal is the PR affiliate of his Move, Inc. which operates websites and mobile products for the NAR. The NAR is the monolithic, monopolistic US housing marketing cartel that controls the market, spending billions to disseminate its propaganda to the public and to manipulate Congress. The incestuous relationship between the NAR and Rupert Murdoch’s organs prevents any possibility of fair and balanced reporting of the news when it comes to housing (or virtually anything else around which Murdoch has his power mongering propaganda tentacles). “Pending home sales” are contracts, reported at the time the contract was signed by both buyer and seller. “Existing home sales” are the closings (aka “settlements” in some states), when the deeds are transferred. The contract is when the actual, real-time meeting of the minds takes place. This is far more timely market data than the data on closings. The closing is the official transfer of the deed, which usually occurs 30-60 days after the date of the contract. This data is then delayed in recording and reporting by another 30 days or so. By the time the media reports “existing home sales” the data is stale. Case Shiller compounds the problem by using a 3 month average, causing another 6 weeks of lag. The Wall Street Journal’s headline was true. But this isn’t news. Sales have been at their highest levels in 9 years since February, if we exclude 2010 when tax credits goosed the market artificially. Note that February is when mortgage rates hit their lowest levels since 2012. Since then they have ratcheted higher. The Journal reported that contracts rose 0.9% in May on a seasonally adjusted basis. No big deal, except for the fact that it’s false. The Journal neglected to report that sales were really down in May, not up, and that apparently a materially increasing percentage of sales are falling through. That fact tells us something more important about the condition of the market than that contracts are at a high level. The Journal has no vested interest in reporting this. It has a vested interest in making the market look good. Contracts actually fell by 2.3% in May. That’s actual, not seasonally adjusted. This is the real number. The seasonally adjusted number is a statistically manipulated number. Real versus unreal; I report, you decide. I looked at April and May data since 2001, and there’s not a shred of evidence of a seasonal difference in sales between April and May. Not one scintilla. Sometimes May sales are up a little from April’s and sometimes they are down a little. It’s about a 50/50 split. Yet the NAR and its media handmaidens persist in this charade of presenting seasonally adjusted data as if it is somehow real and meaningful. They assiduously avoid doing any analysis of the actual data. They probably cover their eyes and scream “I can’t hear you” if this data inadvertently crosses their line of sight. We put the actual data on contracts on a chart and see for ourselves how these real time indicators of the market are behaving. We don’t need any statistical manipulation or propaganda to tell us what the market is doing. We can see for ourselves. Some contracts fall through and do not close. The number of sales that fall through is also a critical market indicator that no one pays any attention to. 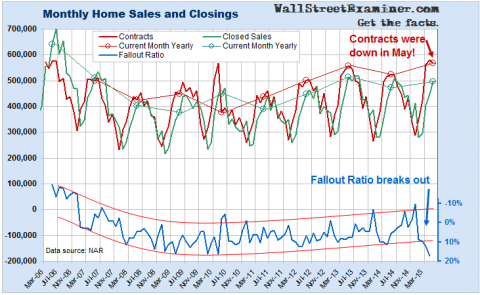 I have developed an indicator called the Home Sales Fallout Ratio to give us an idea of the trend of contracts (aka “pending home sales”) falling through and failing to close, and it is telling us that, while sales are at a 9 year high, trouble is brewing in the current version of the bubbly housing market. So sales were down 2.3% in May in a possible response to a rise in mortgage rates. And the Fallout Ratio has also broken out as mortgage rates have risen off their lows of February. This could be a harbinger of mass destruction should mortgage rates begin a persistent rise from here. It may be time to get in the fallout shelter and out of the US housing market. Look out for the housing mushroom cloud. 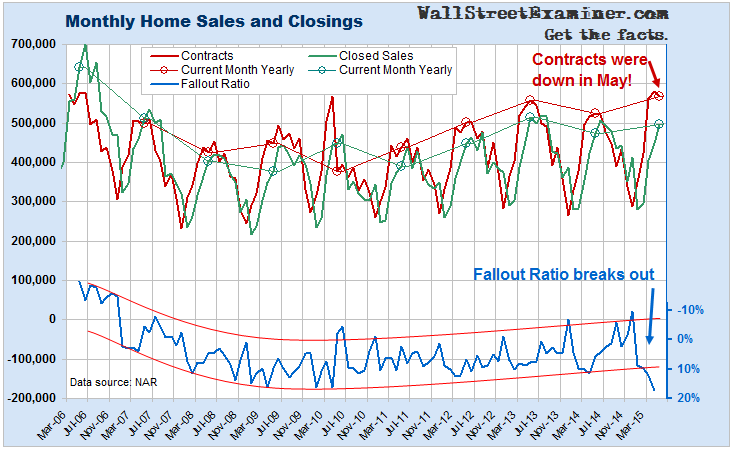 Don’t be a victim of the media manure and home sales fallout.